Imagine this: you walk out your door to see a drone dropping off the package you ordered. 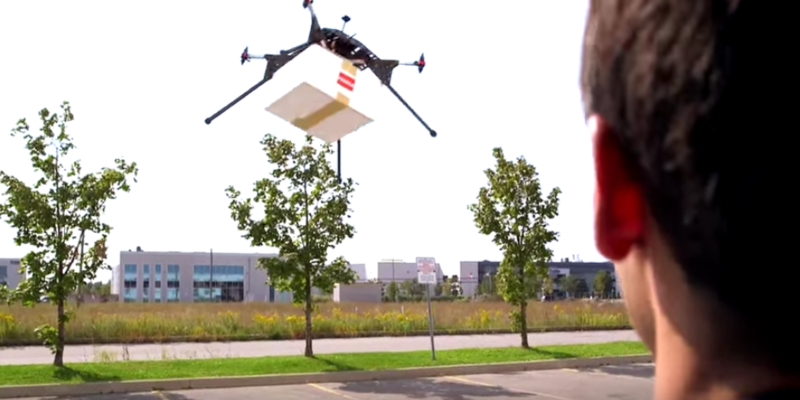 Drone Delivery Canada (DDC) is one step closer to making that happen. The Toronto-based tech firm now has a Special Flight Operations Certificate from Transport Canada allowing them to advance their delivery technology and speed up testing in parts of Southern Ontario. DDC is the first and only drone logistics company in Canada. The tech firm is hoping to create delivery systems in Canadian skies for retailers and government agencies. Specifically, they’re hoping to make deliveries faster, cheaper and easier for retailers. They see an endless number of industries utilizing the service from restaurants to dry cleaners and are looking to serve remote communities in northern Canada where demand is high. The Special Flight Operations Certificate is the first step for DDC in obtaining Operator Status, making them a growing threat for traditional delivery services like FedEx and Canada Post. DDC will be working with Transport Canada which will be overseeing testing. “Our outdoor flight testing will be conducted at various altitudes to a maximum of 300 feet above ground level with flight speeds not to exceed 150 km/h. Our customers and partnerships have indicated their desire for payloads and distances which we expect to exceed as we move closer to commercialization having now obtained our first Special Flight Operations Certificate from Transport Canada,” said Tony Di Benedetto chief technology officer of Drone Delivery Canada in a press release.